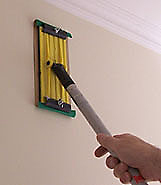 On poor quality walls in older houses you'll often find lining paper has been pasted up prior to painting. This provides a more even surface and so your walls should look much better than they would otherwise. If you are thinking of putting up a patterned wallpaper on a previously painted wall it is advisable to use lining paper first as a backing paper. This provides a much better surface to work on. As lining paper ages, or if it's been badly applied, or if there has been some dampness, you may find it's starting to peel off in places. This can been repaired prior to painting. It often starts to detach from next to the ceiling or skirting. To fix, carefully pull back the loose paper to the point where it's well attached. For repairs I use a traditional starch based wallpaper paste (the type you mix from a powder with water). 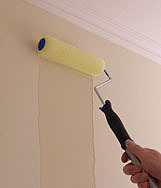 Mix up some paste and apply it with a brush to the wall AND to the peeled back paper. Put plenty on you want it to soak thoroughly into the paper to make it soft and pliable. After leaving to soak for 15 mins. carefully push it back into place. Let it dry thoroughly before painting. If it is coming away along the vertical lines between lining sheets you can't easily peel it back to get some paste inside. You'll need to cut the paper with a sharp stanley knife to form a cross shape, then peel back each little section. Similarly, if you find air bubbles, cut them with the same cross shape to allow access to apply the paste. Try to get the paste right up to where the paper is well attached. Let the paste soak well in until the paper is soft. Remember to rub along any cut lines until the paper blends together with no ridges. If the lining paper is so too bad you may have to remove it with a steam stripper and put up some new paper. 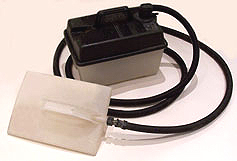 Steam strippers are very inexpensive these days and can save you loads of time. The steam softens up the old paper ready for you to scrape off with a scraper. Hanging wallpaper to a high standard can be a bit tricky so I wouldn't particularly recommend a beginner to attempt hanging a patterned or floral wallpaper especially if it is a expensive one. Far better to leave it to the experts. But with lining paper you should be able to achieve good results as it's much more forgiving of little mistakes and of course you are going to paint over it. The aim is to try and make a good enough job so that when it's painted you can't tell the wall has been papered. Lining paper...this comes in various thicknesses or weights 800(thin), 1000, 1200,1400, etc.(thicker). I tend to use the 1000-1200 The point of using lining paper is to create a better wall surface on which to paint. So the worse your old walls are the thicker the lining paper needs to be. Thick lining paper is 1200 grade and up. Thick lining paper will cover up more imperfections on your wall. It will need plenty of wallpaper paste to get a good adhesion. 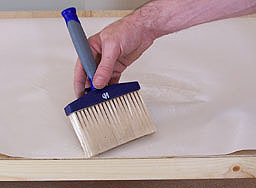 A smoothing roller..... to smooth down edges. Papering scissors...very large scissors to cut nice straight lines. 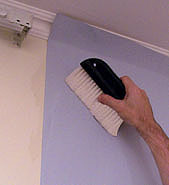 .Allow it to dry before applying wallpaper. (NB you've still got to paste the wallpaper with normal strength paste. Paste them all up on a pasting board. (you can buy a cheap folding pasting board for around £10). Apply plenty of paste(if you use the Solvite type above you can put it on really thick and it will still dry nicely. Make sure you cover every inch and paste right up to the edges. NB If when you come to paint the walls the paper starts to bubble up or peel at the joins then you've either not prepared the walls properly, or not applied enough paste all over the paper. Fold each end in on itself to meet in the middle then fold again. Leave to allow the paste to soak well in. Paste the other lengths and by the time you've done that the first will be ready to use. I like to start my first piece slightly to one side of the rooms main window. Although this is usual when hanging patterned paper it's not strictly necessary for lining paper. 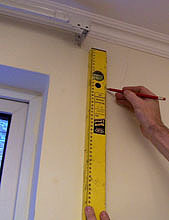 For your first piece draw a vertical line on the wall using a long spirit level or a plumb line(a small weight attached to some string). Line your first piece with this then all other pieces should be vertical. Score the top and bottom where it meets the ceiling/skirting with the back of your scissors. Gently pull the paper from the wall and cut along the score line. Then smooth back down. Carry on around the room. Where you meet corners and objects like door frames etc. brush the paper right into the join. Then score, peel back to cut, and finally smooth back down. Allow the paper to cover the fitting then carefully cut out a x shape from the middle of the switch. Peel back the "wings" then cut them off so you leave a few mm. of paper which you are going to tuck behind the switch. Don't worry too much about any tears or rips you may get as you go round fiddly areas these can be smoothed down, but try to avoid over laps as you do smooth the tears down. Lining paper tips 2 Occasionally when going round tricky areas you may end up having to join two pieces of lining paper together which would otherwise have a large overlap. Rather than leave an unsightly overlap you can achieve a perfect join by cutting through both pieces on the wall with a very sharp stanley knife. It doesn't even have to be dead straight as the under piece will be exactly the same as the upper piece. Simply peel back the top piece to reveal the surplus under piece. You should be able to peel this off if you have cut right through both bits. Then smooth back down the two pieces for a perfect join! If you done a good job of the papering you shouldn't be able to tell that the wall has paper on it when you've painted it!! two coats of matt emulsion is fine. No preparation is required. Some people like to start with a watered down emulsion for the first coat. Generally speaking several thin coats of paint is best. If you apply thin coats you will end up with a more professional smooth finish than if you try to put the paint on too thickly.